TFG Systems has been celebrating its fifth birthday as well as winning The Hedge Fund Journal’s award for Real Time Risk and Portfolio Management. The specialist in the delivery of real-time risk, trading and portfolio management functionality to hedge funds is based in London, but has an international client base that includes; Clarium Capital Management, Peter Thiel’s San Francisco based fund manager; Prologue Capital, the $2 billion relative value fixed income fund; and Ovington Capital, the London-based fixed income specialist fund set up by Curtis Adams, former head of diversified trading strategies at Mizuho Corporate Bank. TFG provides risk management software that is as comfortable with currencies and equities as it is with fixed income and credit, having been developed in a global macro environment. Ovington, for example, uses it to support its G7 fixed income trading activities. TFG Systems only really spun out from its hedge fund parent in 2008, a year which its founders admit was perhaps not the most auspicious time to be launching a technology business into this space, but they felt they had a product which there would be demand for. “We spent about a year working out whether there was a product there,” says Martin Toyer, the firm’s CEO. 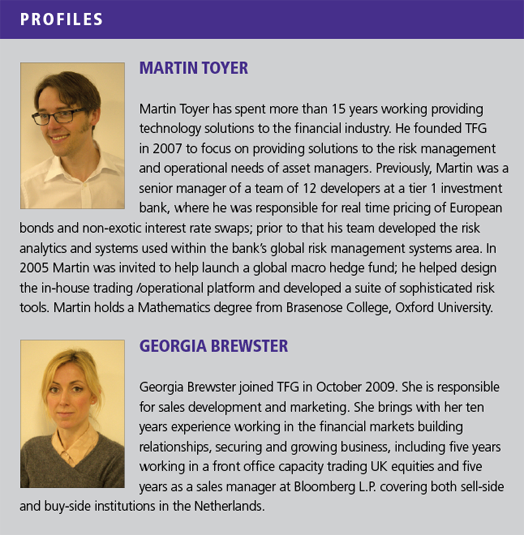 TFG’s founders had experience writing software for an investment bank and a macro hedge fund, and now they support a number of major hedge funds around the globe along with many smaller ones. Their objective when they founded the company five years ago was to deliver a platform which mirrored the level of straight through processing (STP) that was previously only available to large banks. This has obvious attractions for the start-up fund that is staffed by former employees of a large bank who want to enjoy the same level of infrastructure but at an appropriate cost. “The idea was to replicate the institutional-grade software from a bank, take that smooth process and put that into a hedge fund,” says Georgia Brewster, sales managerat TFG Systems. TFG seeks to strip out some of the most costly infrastructure investments a multi-asset hedge fund might otherwise need to make, including the automation of processes, simplification of workflow and standardisation of manual functions like trade matching and splits. Apart from fixed income strategies like those managed at Ovington or Prologue, it is also in use with global macro funds like Peter Thiel’s San Francisco-based fund manager, Clarium Capital Management. Toyer is right to make the observation that many institutional allocators are becoming increasingly demanding about the way funds report, particularly in the case of large pension funds and sovereign wealth funds that are used to receiving high quality reports from other parts of their investment portfolios. TFG Complete, the firm’s flagship product, represents much that is attractive in the new generation of hedge fund technology. It is a hosted solution and can be rapidly deployed and easily configured to meet the needs of both existing and start-up operations. It covers all the phases of the investment operation, from trade capture, performance monitoring and risk management, through to processing and fund accounting. It manages to do this on a single platform. In effect it embraces some of the key criteria that hedge funds are seeking today: ease of installation, full integration, and the capacity to keep businesses small in terms of their head count, but efficient enough to meet institutional operational due diligence standards. Today, funds need to look like an institution, despite the entrepreneurial spirit that still possesses the industry. TFG clients are putting the infrastructure in now in order to be able to grow their businesses. While fund clients like TFG to be flexible and fast-moving, the institutional end investors also like to see a rock solid technology developer standing behind the investment manager. Because TFG Complete is sold as Software as a Service (SaaS), it can be hosted either externally by TFG Systems on its own secure servers, or hosted internally by a fund management organisation. It is essential that such a platform be flexible enough to offer connectivity to third parties, like the fund’s prime broker or administrator for example. The platform is also fully-supported by multiple data centres in order to ensure proper global coverage and real-time risk management. It has a proper accounting system, but as far as the front office is concerned, it is very definitely a P&L and risk system. Real-time in TFG’s case is not just a throwaway comment: the values that TFG Complete uses to calculate front office trading P&L are the same numbers used to generate the fund’s NAV. No time is wasted carrying out reconciliation between the front and back office. The processes take place on the same platform, meaning that the fund manager has reliable data for both internal use and reporting to investors. This has become one of the key differentiators for this offering and sets it apart from several of the other competing offerings: it can calculate VaR and Greeks and carry out stress testing on a sub-second basis. When TFG’s founders use the phrase ‘real time’, they mean it. The feedback TFG has received from the hedge funds industry highlights this ability to be flexible enough to extend the system to support new asset classes. For example, with new asset classes or strategies, a client can make a decision to move into something new confident that TFG will be able configure the TFG Complete platform to support it within two or three months, rather than dump the requirement into a development queue, as might happen with a larger developer. This is one of the luxuries of being a smaller and younger firm, and one of the key benefits for clients which adopt its technology. You simply receive a higher level of service and attention. Simply put, TFG addresses the problem that many fund managers who have left prop desks at investment banks to launch hedge funds have encountered: the additional technology headaches that were taken care of by the bank suddenly end up in the fund manager’s lap and distract them from that demand of day-to-day money management. TFG aims to address this. “It should be thought of as a service rather than a system,” says Toyer. With more focus than ever before on position level reporting, TFG’s application has obvious additional benefit for fund managers with insurance clients, who are going to have to scale up to meet the demands of the Solvency II directive in Europe. Reporting, the TFG partners have recognised, is becoming a bigger part of the entire integration function. The investor piece of the puzzle needs to be served within the model. TFG can generate data the manager needs in a format he requires in order to build his investor reports. While TFG Complete is not a reporting system in and of itself, its users can easily export data from the platform into a third-party reporting system including proprietary systems built by larger investors. Implementation speed is always critical in this industry. In TFG’s case this will vary depending on what is needed, but can be as fast as a month for a relatively simple set up, although on average roll-out is about three months. TFG already works with a number of key service providers and can speedily integrate these into an existing operation (e.g. it recently signed an agreement with Tullett Prebon Information to distribute Tullett Prebon data on TFG Complete and also has agreements in place with Bloomberg, ICAP, Markit and others) but is also aware that managers will want to tailor the infrastructure to their requirements and appreciates that this will take time, and needs to be done correctly. TFG encourages its clients to see its solutions almost as an outsourced support team that replaces the need to have an expensive, internal IT team. The service it offers is not simply a question of switching on the platform and leaving the client to it. With TFG Complete, there is no need for the fund manager to speak to any other third parties apart from TFG itself: it can deal with other external partners like the prime broker or data providers and manage any problems – like a broken feed for example – without the hedge fund manager having to get involved.